Marketing and the language used on labels and advertisements play a large role in how we as consumers select our pets foods.To maintain a healthy and comfortable lifestyle it is important that your pet gets the correct nutrients it needs. Take the time to educate yourself on what your pet is really consuming and not what advertising is feeding you. Just like packaged food for people, pet food must list ingredients by weight, starting with the heaviest. If the first ingredient listed on your pet food packaging is a type of meat, remember that meat is about 75% water and without that water weight, the meat would likely fall lower on the ingredient list. If the same percentage of 2 or more ingredients is used, the manufacturer chooses the order of ingredients. Meat meals, for example chicken meal or meat and bone meal are different with the majority of the water and fat being extracted, which concentrates the animal protein. Flavor (i.e. Chicken flavored, beef flavored, etc.) no requirements on the percentage of ingredient in the feed. What is the guaranteed analysis mean? The AAFCO (Association of American Feed Control Officials) requires the guaranteed analysis of four standards which must be listed on all dog food labels. These four standards are the minimum amount of protein and fat in the food and the maximum percentage of fiber and moisture. Low-fat dog foods often contain less fat and more fiber, filling up your dog without adding extra calories. It is also important to note the AAFCO statement should say what life stage the food is appropriate for. 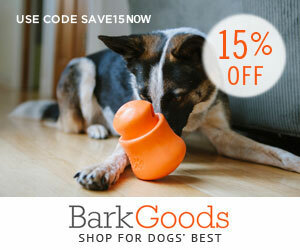 When purchasing for puppies look for food labeled suitable for growth or all life stages. For adult dogs, look for adult maintenance or all life stages. Nutritional needs for older dogs can vary depending on their health conditions, and there is no AAFCO standard for senior dogs. 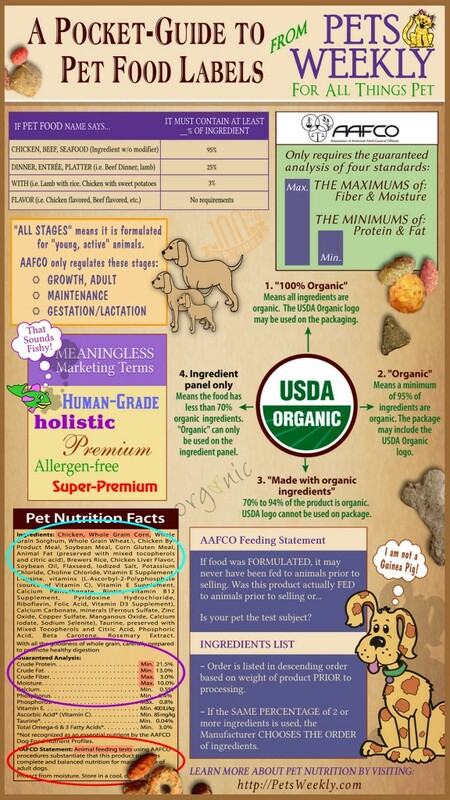 Beware of dog foods labeled with terms such as “human-grade”, “holistic”, “premium”,”allergen-free’ and “super-premium” — these are marketing terms and there is no rule that governs how they’re used. Food labeled “100% Organic” means all ingredients are organic. Food labeled “Organic” means a minimum of 95% of ingredients are organic. Food labeled “Made with organic ingredients” means 70% to 94% of the product is organic. If organic has been listed on the ingredient panel only it means that less that 70% of food contains organic ingredients. Check out and print this helpful infographic from petsweekly for more information before your next dog food purchase.